During a three-week operation, an estimated 5,500 Nigerians are set to be flown back, The International Business Times reported. Most of them are severely emaciated due to lack of nutrition and continuous torture. 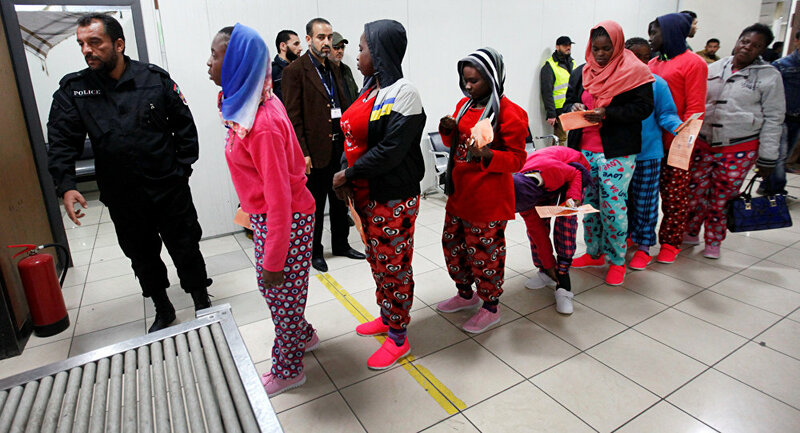 According to numerous corroborating reports, the migrants, who include pregnant women, have been mistreated in their increasingly doubtful attempts to rely on criminal groups to traffic them across the Mediterranean Sea to Europe. According to the BBC, they are subsequently traded for peanuts at slave markets that have popped up in Libya, and frequently refer to their conditions as hell on Earth. Conversely, less than a decade ago, as one of Africa's wealthiest countries, Libya provided work in the energy and construction sectors to an estimated 2.5 million foreign workers, including approximately 50,000 Nigerians. Fewer than 500 Nigerians were brought in by the government in the first round of evacuation on Sunday (7 January); the frail former slaves getting food immediately upon arrival. About 5,000 more people are waiting for their turn, having been most typically placed in a detention center in a place dubbed Gharyan, about 100km (60 miles) south of Tripoli. Libyans could hold them prisoners for several months to a number of years, the former detainees complained to the BBC. "They give us out to their friends. They don't pay us. It's just hard labor; if you're not fast with your job, you get beaten." The Nigerian administration has promised rehabilitation measures to get the victims on their feet – something that most victims exclusively pin hopes on after so many hardships abroad. "They talked about various abuse — systematic, endemic, and exploitation of all kinds. There were obviously interests that wanted to keep as many of them there as possible because they were commodities," said Nigeria's Foreign Affairs Minister Geoffrey Onyeama. "The president had made provisions for all the logistics to make sure that we bring you back from Libya," he said, adding that the government will also help the evacuees in safeguarding jobs in their home country.